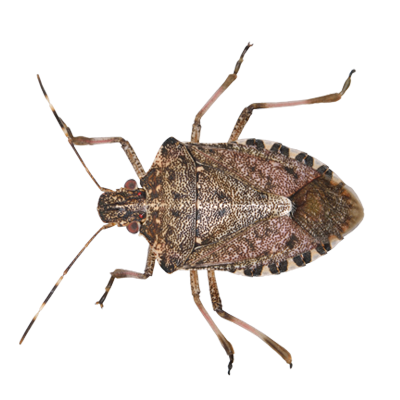 The brown marmorated stink bug is a brownish bug with a shield shape. They are named for the smelly scent they give off when squished. They are just over a half an inch in size and can have copper, black or gray markings. They can be quite damaging to fruit and vegetable crops. These are often confused with the western conifer seed bug. The back legs are the main difference. The stink bug has straighter, more cylindrical hind legs, whereas the western conifer seed bug has widened legs with a leaf-shaped area.